Sunny is still the go-to brand for anyone who wants an inexpensive stair climber, while Bowflex continues to dominate the high end with its gym-quality treadclimbers. We recommend the former for anyone who wants compact workout equipment for occasional use, and the latter for fitness enthusiasts who want to exercise daily at home. Small but sturdy, the Sunny Twister Stepper with Handle Bar gets raves for its easy assembly, quiet operation and thorough lower-body workout. Many say that it has been extremely effective for helping them lose weight when combined with an overall diet and exercise program. The handlebar gets a lot of praise for helping stabilize the user, and the timer, which counts time elapsed, total steps and calories burned is also a popular feature. If you'd like a handy way to work out while traveling, doing work, or just need exercise equipment that won't take up too much space, look no further than the Sunny Health & Fitness Mini Stepper with Resistance Bands. 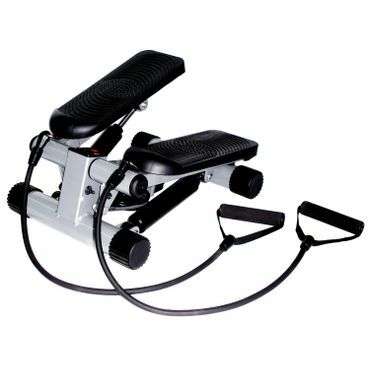 Users say these little pedals give you a great lower body workout, while the attached bands help to work your arms as well. The mini stepper is light, compact, and has a small LCD readout that displays time, step count and calories. The high-end Bowflex TreadClimber TC100 can hold its own against commercial gym-quality machines, say happy reviewers. This is largely due to the unusual workout it provides, which combines the action of a treadmill, elliptical and stepper; one expert says it's one of the most challenging low-impact workouts you can get. The TC100 includes an ergonomically designed console with a backlit LCD screen and a media shelf for a tablet, smartphone or music player. Basic stair climbers are small, often portable, and affordable. They can be little more than a pair of sturdy pedals on a frame. Other models may have bands to work your arms at the same time, a stationary bar to help you keep your balance, or a movable handlebar for an upper body workout. Upgraded stair steppers have features such as step tracking, speed, heart monitors or workout tracking. Reviewers say that stair steppers can give you an excellent workout despite their basic looks. They can also be easily stored in a relatively small space. Some are great for travel and can provide a portable workout. 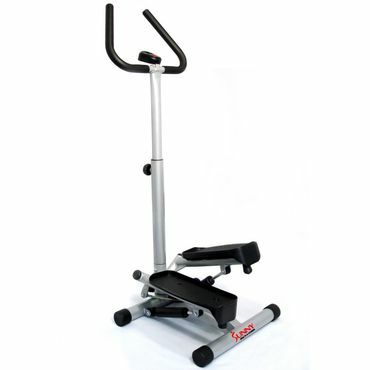 Treadclimbers offer a more versatile workout than basic stair steppers. Also called "hybrid stair steppers" or "treadmill alternatives," treadclimbers combine the movements of a stepper with those of a treadmill and/or elliptical, working more muscle groups than a basic stepper. While we use the term "treadclimber" here, note that this term actually refers to a proprietary hybrid-type machine made by Bowflex. Experts say you should consider a treadclimber if you have joint issues that might make even a traditional stair climber too tough to use. 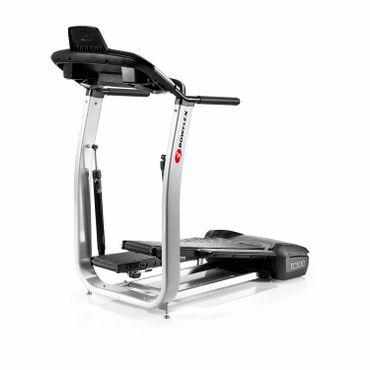 Another benefit of these hybrid steppers is that they have a much smaller footprint than either treadmills or elliptical machines, so they would be a good choice if you're short on space. On the downside, they tend to be pricey, but plenty of users say that they are all you really need in a home gym. If you're still unsure whether you'd be better served by another type of equipment, check out our reports on treadmills, elliptical trainers and exercise bikes. Want to give up your gym membership altogether? See our report on home gyms for the best alternatives. Unfortunately, we found no reputable expert reviews of basic stair climbers, though there are a couple of adequate expert sources for treadclimbers. Those include the in-depth reviews at TreadmillReviews.net and FitRated.com. Owner reviews are much more helpful when it comes to inexpensive stair steppers. Amazon.com is by far the most useful source of reviews, with hundreds of real-world perspectives from owners who have put their exercise equipment through the wringer of daily use. Walmart.com and Target.com also have a smaller collection of reviews on popular stair climbers.